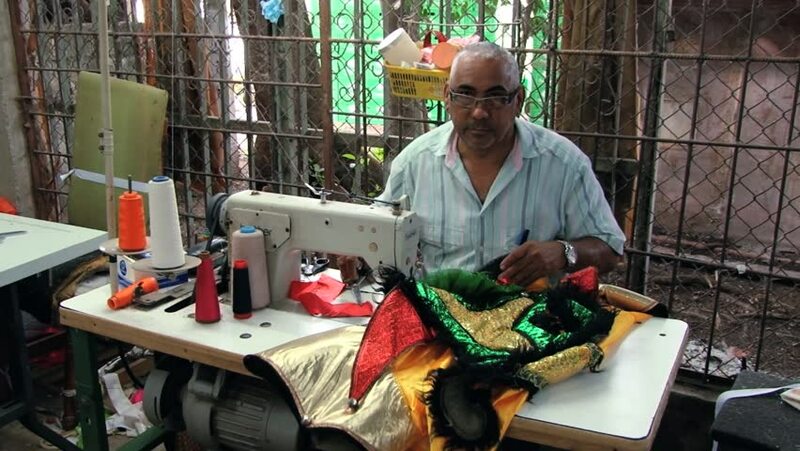 LA VEGA, DOMINICAN REPUBLIC – NOVEMBER 10, 2012: Unidentified man stitches details of the traditional carnival costume in La Vega, Dominican Republic. hd00:15BANGKOK, THAILAND, 2103: A Thai lady cooks grilled pork balls on skewers at the market in Bangkok, Thailand. hd00:08MUMBAI, INDIA - 11 JANUARY 2015: Man with orange hair sitting in front of a street stand in Mumbai. hd00:13DELHI - NOV 13: Vegetable street vendors with their mobile stands on November 13, 2011 in Delhi, India. India ranks second worldwide in farm output. Agriculture employs 52.1% of the total workforce. hd00:26DELHI - NOV 13: Street vendors selling vegetables on the street on November 13, 2011 in Delhi, India. India ranks second worldwide in farm output. Agriculture employed 52.1% of the total workforce.